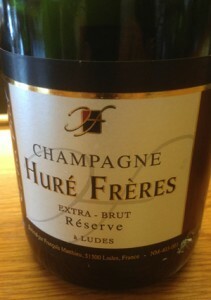 nv Hure Freres, Extra Brut, Reserve Champagne, a Ludes, France. This Extra Brut Reserve from Hure Freres displays rich yeasty elegance with dense power and vitality of mineral tones and acidity, giving a lush out feel, but with good energy, it is golden in the glass with vigorous beading and creamy mousse. The Reserve is a cuvee of 45% Pinot Muenier, 40% Pinot Noir and 15% Chardonnay, all coming from family owned plots, farmed organic and mostly biodynamic, the base wine spends an extended time on the lees and it gets a minimum dosage, adding up to a stylish Extra Brut with layers flavors and lifting vibrancy, this is really hedonistic bubbly. The nose has a classic bready/dough and toast note with light citrus, fig and dried fruits along with hazelnut, apple butter and lemon on the palate, it shows a decedent vinous expression and a bit of nervy tension, finishing lavishly long and poised, this is a very fine and thrilling offering from Hure Freres. Drink this lovely Champagne over the next 3 to 5 years, it is perfect for #ChampagneDay2015 or the coming holidays, or even better with any meal or any damn time you feel like it, best from 2015 to 2020.